Spotted these instore today. Long been discontinued and only a few places still do these @ around £35 each. Based on R2s look from the original trilogy, R2-D2s head spins, a light flashes and the R2D2 sound is produced whenever there is an incoming call. Demo mode. Redial, tone/pulse. The helmet unit also features three sound effect buttons, producing realistic recreations of the saber swing, the Imperial March and of course, Darth's famous heavy breathing. The Darth Vader Phone also features a standard ringer mode, ideal in case you have elderly relatives with weak hearts/bladders visiting. Other features include electronic push buttons with tone dialling and a last number redial function. This is a phone you just have to have if you're a Star Wars superfan. It's out of stock now. How can it be out of stock when the deal's instore?! They stock loads of them on their outlet. Woolworths have an 'outlet' :? On the website it does say the darth vader one is out of stock,but as this says instore doesnt apply.My local big w has an outlet part to it.Will be having a look for one of these today!Hot deal! I got one year ago as a Christmas present from a girlfriend. Most awesome present ever! The earpiece then was really uncomfortable against your ear though. Not sure if they've redesigned. It cost about £80 back then, so £15 is a steal! 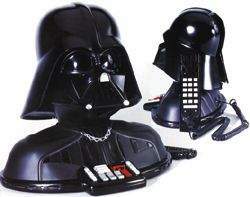 Didnt get to big W but to middlesbrough woolies and just had one darth vader phone and price still 27.99! Which store did you buy it from? Woolworths have an 'outlet' :? they have some shops with a special corner which they call it outlet. Still 28 quid in the local Woolies, bah! If it helps anyone, the store I saw these reduced is at Swindon. Must be local, called a few shops in the Midlands (Long Eaton, Alfreton, Nottingham), the first two had one left each but still at £28.